The statement offered few specifics, however, and is unlikely to quiet the questions swirling around the C-27J after Alenia said it would refuse to support used aircraft sold by the US to third countries. The US, which ordered 21 C-27Js, cancelled the program earlier this month due to budget cuts and is reportedly seeking buyers for its nearly new aircraft, all of which have been delivered since 2008. Alenia and L-3 have a longstanding partnership to market the C-27J through the US Foreign Military Sales (FMS) program, and today’s statement indicates their position that an FMS purchase of new aircraft remains a viable option for Australia. It’s unclear how much the US withdrawal from the program will impact the long term cost effectiveness of an FMS purchase, but it’s not likely to make it a more attractive option. It is understood that Alenia and Raytheon Australia are also partnering to offer the C-27J to Australia as a direct commercial sale. Airbus Military, meanwhile, has used the turmoil surrounding the C-27J to launch a renewed push in favour of its C295 airlifter, though the RAAF has expressed a clear preference for the C-27J’s larger cargo hold and better short field performance. In response to questions over Alenia’s refusal to support used C-27Js, a Defence spokesman said support arrangements would be taken into consideration as the ADF weighs its options. “The support capacity and ability of manufactures and suppliers…are part of the evaluation process for all Defence acquisitions,” the spokesperson said. The US Defense Security Cooperation Agency in December flagged the possible FMS sale of 10 C-27Js to Australia for an estimated US$950 million, but much has happened since then. Just buy the damn things from Alenia. A Caribou replacement has been ‘on the books’ since before I was born! Or, another 12 Foxtrot-Chinooks. Just make a decision! for Caribou replacement. how can the armed forces operate, with out proper equipment to their tasks? Having followed the Caribou replacement issue for some time, I concur with Andy’s sentiments. From what I have read this aircraft appears far more capable than the C-295 and more compatible with the C-130 (Herc) in terms of same engine, flightdeck & operational characteristics, and importantly its palletised cargo (RORO) capacity in that pallets can be moved from or to a Herc without having to be repacked in the case of the C-295. The C-27 J is also combat proven. Alenia should be a bit careful in their statements in regard to not supporting these aircraft if sold off by the US Military. After all if these aircraft did happen to be purchased for the Aus Defence Force, they will most likely have a 30+ yr service life and would still require refits/rebuilds etc with parts/assistance from Alenia or their subsidiary contractors. In this respect it would still be a win for Alenia, not to mention getting a foot in the door for the SE Asia/Pacific region for potentially other business & aircraft sales. In relation to other desperately needed air transport requirements, the purchase of the C17 Globemaster is another case in point . In this instance it was deemd that Aus severely lacked the transport capability to support military and civilian/natural disaster events. I think we managed to get out first C-17 within 9 months of the decision being made. Another case – Aus Navy just purchased a relatively new (6yo) modern transport ship from the UK Navy (formally the Largs Bay), now called HMAS Choules. There was an urgent need for this transport capability to replace the now retired HMAS Kanimbla & Manoora. Our naval transport capability was found wanting, in particular our capacity to respond to natural disaster events. Once again this decision was able to be made in record time & an appropriate vessel sourced to replace this capability. Similar to the above examples, the requirement for medium airlift capability is desperately needed now since the retirement of the Carabou. Why wait until 2016-17 to get new build aircraft when we could possibly get relatively new, low time aircraft now. the Aus Govt needs to pursue this issue with vigour with both Alenia and the US Govt (FMS?). With the current exchange rate this may also give us good value for money. 10 C27J’s for $950 mil. That’s $95 mil per aircraft. This sounded wrong when I read it and a search on Wikipedia suggests the unit costs for these are about $54 mil. Any idea why the premium. Even with support built into any contract, double the unit cost sounds a bit rich. its all well and good to purchase new aircraft , however if you don’t have the crews to fly them, they won’t go anywhere. After flying C-130 E,H and J at Richmond for 20 years as a Loadmaster I’m well aware of all the issues. There are a significant number of loadmasters injured , including numerous loadies who have resigned or commissioned out of disgust and frustration with a lack of support from all levels of management. An don’t just think we have sufficient C-130H crews to man these new frames.!!!!! Kenny, to answer your question, the price of $950 million is not just the cost of the aircraft. It also includes logistic support, mx equipment, and the training of the aircrews. Buy the ex-USAF birds and add a few extra airframes…. If we don’t buy the C-27J we’re idiots. Simple – on capability grounds – outstanding, cost grounds – absolute bargain. The universal theme from all these posts is: make a decision! Surely the quickest way to do this is directly through the US Defence Department. How hard is that? But why do we “need” the C-27Js anyway?? The C-17 at least increased Australia’s airlift capability since it can carry more than double of a C-130 load! But a C-27J can’t even effectively transport most current in service army vehicles! The C-27J is by far a poor choice, but it is the best choice on offer… Stuck between a rock and a hard place! The difference between having C17As, C130Js and C27J is pretty obvious if you think about it. A C17 can carry large loads long distance from A to B, eg, from here to the middle east or direct in to Afganistan, those loads can then be split across C27J’s for example to then be delivered to other or multiple locations where a C17 would be way too big to get into or we wouln’t want to sent into. Having a variety of airframes of different size and capability allows for the efficient and practical movement of cargo, there are times where even a C130 is too big or half empty, so why not use the right size aircraft for the right job? When you said a C27J can transport most current in service army vehicles, what do you mean? Of course it can’t fit something that is so large than only a C17 will do, but the C27J has the same fuselage cross section as a C130, eg, anything that can fit in a Herc (height x width) will fit in a C27J, the other contender, the CN295, on the other hand has a smaller fuselage cross section. I don’t understand why you say its a poor choice, a poor choice compared to what? And for what purpose? C-27J appears to have incredible power and a similar (not equal at all) to the C-130 which leverages its ability to comply with certain missions. It has a 2,400 nautical mile range and a maximum payload of 13,000 pounds (5.900 kg). 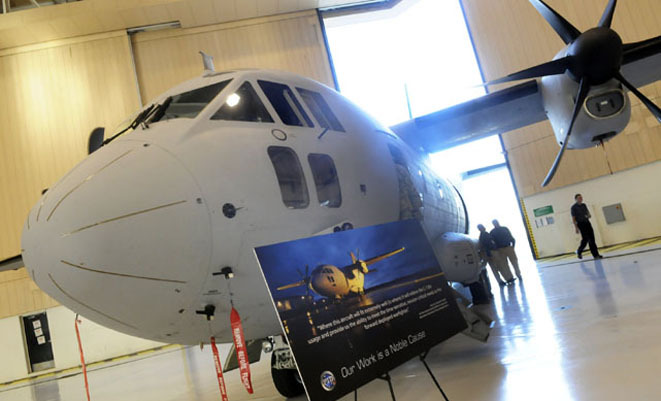 The C-27J is capable of self-deployment to theater. • The C-27J can carry three standard pallets, six bundles for airdrop, 40 passengers, 26 combat-equipped paratroopers, or 18 litters for medical evacuation. DOT&E completed a Combined Operational and Live Fire Test and Evaluation Report for the C-27J in May 2011. Two aircraft deployed to Afghanistan in August 2011 with both Air National Guard and Army National Guard crews. The C-27J is not operationally suitable. Shortfalls in availability and in several subsystems adversely affect safety, situational awareness, or workload. – Post-MOT&E data show that the system meets its reliability requirement. – During testing, the high cannibalization rate to maintain operational aircraft suggests inadequate spare part supplies. The Air Force has implemented corrections to suitability problems with the Heads-Up Display and the cargo handling system. Additional operational testing is needed to verify correction of deficiencies. A planned update to the aircraft software, which includes improvements to the flight management system and integration of take-off and landing data calculation, has been postponed indefinitely. If our US ally is declaring these issues, shouldn’t we think about what could it mean to Australia if US do not use this platforms any more? Are we going to do mid life upgrades with the Italians, the greeks, bulgaria or Morocco?? it is a non sense and a in depth analysis need to be done and this only can be done with a tender. A decision not taken in 20 years is going to be taken with this level of uncertainty?? at double the price? ?